Although I’ve had the button on my sidebar for awhile, I haven’t formally announced my participation in the Art History Reading Challenge. The challenge asks participants to read at least three books about art in 2010, but the books can be fiction or non-fiction and span many genres. Just how much art the novel must include to count is up to the reader. I have already read, and will soon review, Karen Essex’s “Leonardo’s Swans”, and there are a few other books about art on my list to be read. I’ve decided to start small and aim for the ‘Curious’ level of participation, which requires three books, but may read more if I continue to be interested. I’m also participating in The Ireland Challenge 2010 hosted by Books and Movies. With St. Patrick’s Day only a few weeks away, I can’t imagine a better time to take a look at Irish History… or to tackle those untouched books on Ireland currently occupying my shelves! The challenge allows re-reads, and counts any book “written by an Irish author, set in Ireland, or involving Irish history or Irish characters”. It also permits fiction and non-fiction reads. I’ve chosen to enter at the ‘Luck o’ the Irish’ level that requires four books. Hopefully I’ll have some Irish luck on my side as I participate in these additional challenges! I’m so glad you’re joining us for the challenge! 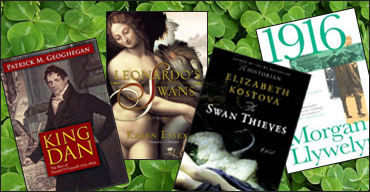 And I look forward to your review of Leonardo’s Swans – Karen Essex is a favorite author. Thanks Carrie! I have quite the interest in Irish history so it looks like a lot of fun!